Mahabalipuram, also known, as "Mamallapuram" is 58-km, south of Chennai, and possess many marvelous monuments with Sculptural Panels, Caves, Monolithic Rathas (chariots) and Temples. 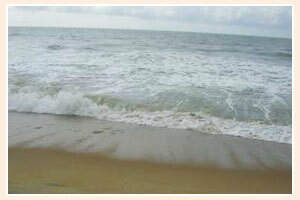 Mahabalipuram beach attracts thousands of tourists throughout the year. The beach is an ideal place for sunbathing and lazing around. The sea is rough and swimming is not recommended. Many magnificent monuments are also built beside the beach. You can also visit the temples built nearby. Penance of Arjuna, Rathas, and shore temples are worth visiting. Other places worth a visit while on a tour to the beach include the crocodile farm where about 5000 crocodiles of 6 different species, alligators and other reptiles are bred in captivity, kept in open, marshy enclosures, snake venom extracting centre and a school of art and sculpture.